With Keith and Rebecca's blessing, this assignment is offered by one of its members, grateful for the years of patient, wise instruction the Spirit site has freely given over the years. A recent post by Wildshutter, Time to Change, impressed me with the rich beauty that back-lighting can provide. In the night scene autumn colored leaves become luminous against a night sky, lit by what I would guess is yard lights on the property. 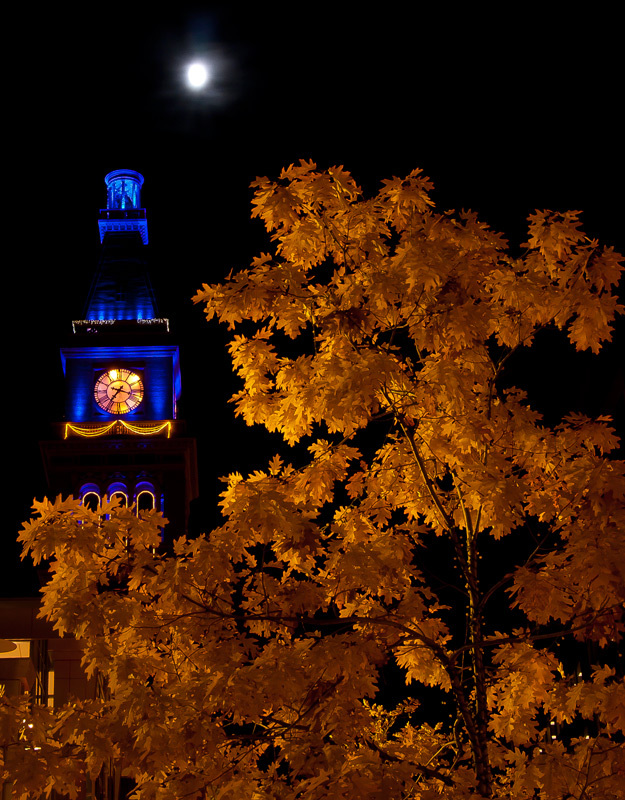 The gorgeous golds are intensified by soft blue accents on a clock tower. Our assignment from now through Nov 20th is Back lighting. This is a little different than the Contre-Jour assignment of last year, although this is an opportunity to revisit those lessons and strengthen your skills in that style. But where Contre-Jour often hides the details of the subject in the contrast of dark against light, this assignment invites you to also explore ways in which a play of light through transparent and translucent objects reveals hidden details in your subject, for example in the veins of leaf or layers of cotton fabric. You might also experiment with a play of shadows projecting into the foreground to add drama, how a bit of light transforms atmosphere, fog or mist, in unexpected ways. In short, it's another fun chance to study the magic of light itself, and take some new creative leaps. Autumn is a great time for this technique as foliage back-lit by the sun turns every leaf into a jewel, revealing unexpected color. You are encouraged to share you techniques, talk about your discoveries in this post, as we help each other get steadily better at our craft. Artificial lighting caught in winter fog creates a play of color and adds mystery to a stand of city trees. 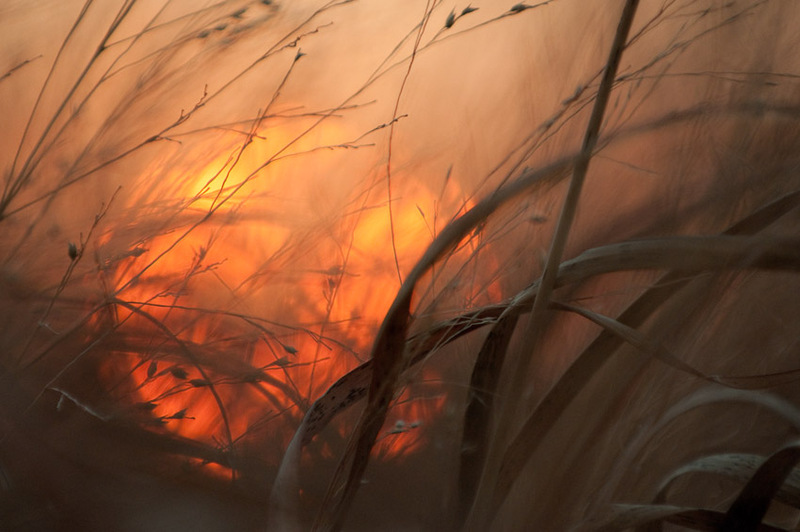 A setting sun shows a simple grass patch in a new way. I'm excited to see what you discover. Thank you very much Dave. Your image of trees in the fog is amazing and inspiring. Photographing into a light source presents some unique challenges. The most significant are the strong potential for blown highlights, inadequate illumination on the surface facing camera, and also unwanted effects caused by lens flare. Some of these are unavoidable and the photographer must take care to manage them, or even exploit them for artistic effect. Lens flare is caused by stray, non-image forming light reflecting through the lens elements and image sensor. Its effects can blossom across the entire image, obscuring detail and contrast. Use of a lens hood may help minimize lens flare - unless your light source is within the frame. Its appearance can be controlled through depth of field or placement of the light source behind other objects. The angle of incidence when shooting into light can create areas of surface reflection that are outside the recording range of your camera. The effect can be controlled and exploited. Rim lighting of an object can be a powerful tool, but blotches of burned-out areas can be very distracting. Try experimenting with composition and angles until these areas are minimized or work in favor of the image. In some cases light modification is needed. The source light can be softened using diffuser panels. Another method is use of reflectors or fill flash to lower overall contrast. We can also use trees or shrubs to break up the light, then use a shallow depth of field to create lovely bokeh effects. Unless you are capturing the play of light through translucent objects you may need to use light reflectors or fill flash. When that isn't possible try taking a range of exposures, then blend them together in post-processing. There are a number of great tools, such as PhotoMatix, which can help with this. As I was driving down a country road close to home I was frustrated by the scorched, ugly landscape a brutal summer created. There was no color, everything looks dry and fried. But evening can do magic on the worst of scenes. I saw the powerful silhouette of a tree toward the end of the road, and the sun was on its descent. The sky was featureless, no clouds to soften the light, so my best option was to place the sun directly behind the trunk of the tree and let it illuminate the atmosphere around it. Even when hidden the effects of the light were so contrasty that I knew it wouldn't play well. An exposure set to capture the detail along the foot of the tree would leave the sky blown out and ugly. If I exposed to keep some color detail in the sky everything eles was lost in a featureless black. So I did a set of bracketed exposures. An image optimized for ground detail was used as a base, and one for sky added as a layer above then carefully blended in to replace the blown-out whites. I also the "detail extractor" plugin from Niksoftware's Color Efx 4 to bring out some hidden texture in the grass. Thank you Lars. I made that change to the album. The angle of incidence when shooting into light can create areas of surface reflection that are outside the recording range of your camera. The effect can be controlled and exploited. Rim lighting of an object can be a powerful tool, but blotches of burned-out areas can be very distracting. Try experimenting with composition and angles until these areas are minimized or work in favor of the image. In some cases light modification is needed. The source light can be softened using diffuser panels. Another method is use of reflectors of fill flash to lower overall contrast. Even when hidden the effects of the light were so contrasty that I knew it wouldn't play well. An exposure set to capture the detail along the foot of the tree would leave the sky blown out and ugly. If I exposed to keep some color detail in the sky everything was lost in a featureless black. So I did a set of bracketed exposures. An image optimized for ground detail was used as a base, and one for sky added as a layer above then carefully blended in to replace the blown-out whites. I also the "detail extractor" plugin from Niksoftware's Color Efx 4 to bring out some hidden texture in the grass. Great tutorial. Thank you again.